Don Scheerer secretary/treasurer of the Crawford County Veterans Hall of Fame; Timothy Hicks, plant manager of Timken’s Bucyrus Operations; and Chuck Christman president of the Crawford County Veterans Hall of Fame. On Thursday, Hicks presented a $25,000 check to the Crawford County Veterans Hall of Fame monument fund. Courtesy photo From the right: Don Scheerer secretary/treasurer of the Crawford County Veterans Hall of Fame; Timothy Hicks, plant manager of Timken’s Bucyrus Operations; and Chuck Christman president of the Crawford County Veterans Hall of Fame. On Thursday, Hicks presented a $25,000 check to the Crawford County Veterans Hall of Fame monument fund. 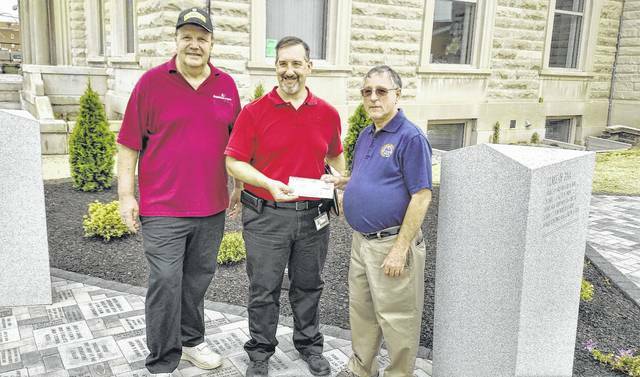 https://www.galioninquirer.com/wp-content/uploads/sites/38/2017/07/web1_veterans-donation.jpgCourtesy photo From the right: Don Scheerer secretary/treasurer of the Crawford County Veterans Hall of Fame; Timothy Hicks, plant manager of Timken’s Bucyrus Operations; and Chuck Christman president of the Crawford County Veterans Hall of Fame. On Thursday, Hicks presented a $25,000 check to the Crawford County Veterans Hall of Fame monument fund.